Is it time for a D23 Bag O’Swag giveaway? Now you can feel like you attended D23 too! Without the lines! And lots of exclamation points!!! I’m sure you’re dying to know what you will be winning. Keep in mind that I scoured the floor of the Expo looking for free stuff just for you, because I love you that much. You’re welcome. 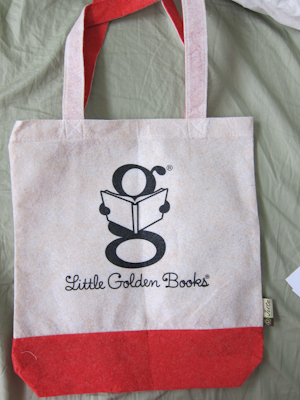 First up, a reusable bag from Little Golden Books. Did you know Disney owns Little Golden Books? Well they do, and you can shop in style with this save-the-world shopping bag. This complementary two-tone jute bag features a flat bottom for easy loading and two securely attached handles for carrying in the hand or over the shoulder. The people behind you in line at Target will seethe with jealousy as you get your 5 cent discount with this bag. The G knows how to read--I'm impressed! 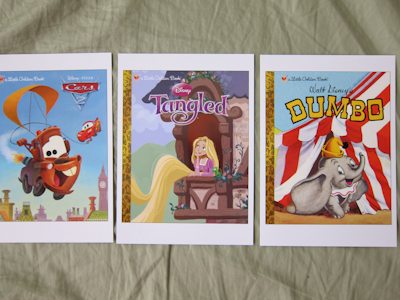 Next up, also from the Little Golden Books booth, a set of three cards with the covers of Disney Little Golden Books, suitable for framing. They also come with a bonus coupon code on the back, and that my friends, is worth winning the contest just by itself. If you are in the market for Little Golden Books. Thinking of traveling out into the grasslands? 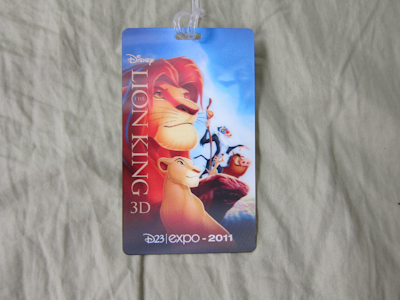 Well it will be impossible to lose your bags with these D23 commemorative 3D Lion King luggage tags! Say “hakuna matata” to all your lost luggage worries with these tags, rendered in spectacular 3D with a secure sleeve for your personal information. If you just can’t wait to be king, you’ll travel in style with these bad boys. “But Shelby, there’s only one in the picture!” FEAR NOT dear readers, there are two of them and YOU will be getting them both. 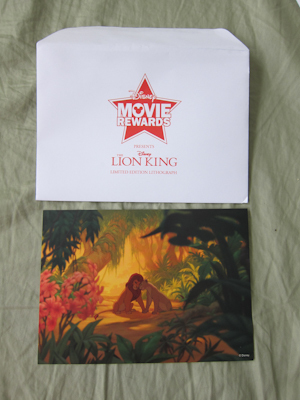 If the Lion King luggage tag wasn’t enough to satisfy your inner hyena, the Disney Movie Rewards club gives you a Lion King limited edition lithograph! I don’t know how limited this edition was, but I’m pretty sure it’s very special. Suitable for framing, this lithograph features Simba and Nala feeling the love tonight. And you’ll feel the love too! Is it possible that there could be even MORE amazing stuff? YES!!! 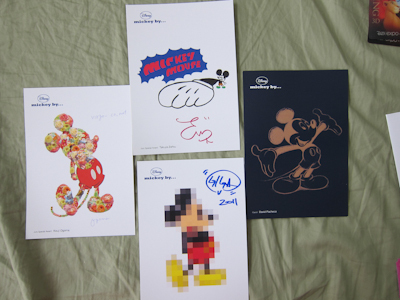 Straight from the UT Grand Prix 2011 Mickey By the World Mickey t-shirt design contest–four cards of winning entries! I know that sounded confusing, so I’ll translate–there was a t-shirt design contest and these cards are the designs that won. Each card is signed by the artist. No way? I KNOW!!! These heirloom quality cards depict the depth of potential in Mickey Mouse art. Suitable for framing. 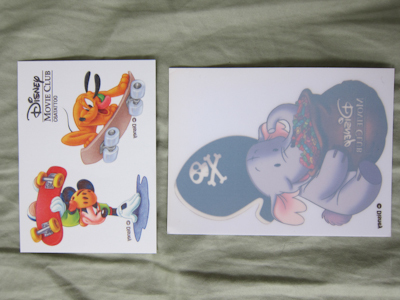 Also from the Disney Movie Club, two tattoos (temporary) of Mickey and Pluto going all wild on their skateboards. Mickey is appropriately wearing his helmet, but you’ll have to have a talk with your child about how Pluto is a dog and doesn’t need his helmet but if I ever catch you riding a skateboard without yours you’ll never see the skateboard again, got it Mister? Also, there’s a pirate elephant decal! No safety lesson in that one. 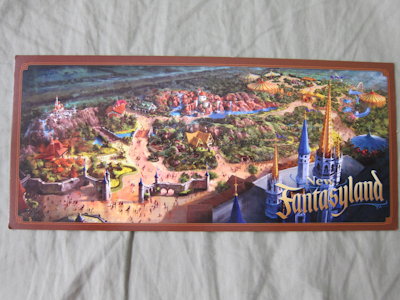 Dying to know what the Mouse-in-Law’s Fantasyland expansion will look like when its done? Just feast your eyes on this snazzy extra-long postcard. It probably costs more to mail than a regular sized postcard, but that won’t matter because you won’t want to let this one go! Suitable for framing. 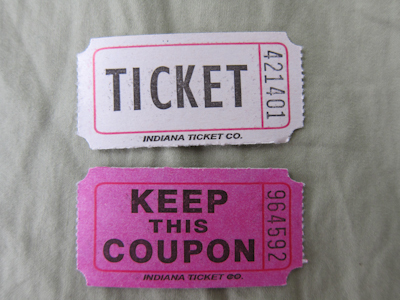 That’s right–not one, but TWO raffle tickets that were complete losers! You’ll feel like a real car-driving princess* as you gaze upon these two non-winning tickets, suitable for framing. Approximate retail value: $0.00. This Bag O’Swag prize will surely make you the envy of whoever cares about this kind of thing, and I know you will want to get your hands on it ASAP. 1) Leave a comment on this entry telling me what you would like to see me blog about next. 2) Like MYWTM on Facebook and leave a comment here, if you already like MYWTM, leave a comment saying so. 3) Harass and bully Encourage your friends into liking MYWTM on Facebook. They must leave a comment there or here with your name. 4) Post about MYWTM on your Facebook page including a link to this site or to any specific entry. Report back here when you’re done–Mouse’s honor on this one! Contest ends Thursday, August 25th, 11:59pm Pacific time. Hmm, what to write about next – I’ve never been to Disneyland so it’s hard to choose! Do you have a favourite Disney animated film? And is there anything special in the park about it? Great question! My favorite animated film is The Lion King and no, sadly there isn’t anything in the park about it! 😦 Animal Kingdom at the Mouse-in-Law has an AMAZING Lion King show. Aw I love the Lion King too – it was my sister’s favourite movie (tied with 101 dalmations) as it came out when she was about 4 – I was already 11. Mine is Beauty and the Beast! The Lion King on Broadway is awwwwwwesome too. It really is truly awe-inspiring, the presentation of “One by One” is incredible. I’m surprised there’s no Lion King themed places at Disneyland! Maybe they’ll do something with the theatrical re-release? I’m waiting to go without Theo to hit Splash Mountain! I’m anxious to see it after its refurb this winter. I’d like to see you blog about either Carnation Cafe and Chef Oscar, or the silhouette studio. And I like you. On Facebook, I mean. Ooooohhhhh, a rogue Disney fanatic you are! I will have to hop into the Carnation Cafe before they close it up to expand it. What to review? How about Indiana Jones or the tree house to finish off the Adventure land traffic clog? It would be nice to polish off a whole land, wouldn’t it? I’ve actually never been in the Tarzan version of the tree house! Love, love, love this blog! I am Disney obsessed. Heading to Disneyland next month! Can’t wait. Now as to the swag bag….yes please. My daughters all time favorite Disney thing is The Lion King so we were so excited to see the cool stuff! It’s very cool :). You’re going to have a great visit. It’s my favorite too! The 3D looks very cool. I would like to see some more blogging about d23, or did you mention an up coming disney cruise? I only have one more very minor D23 post because I just went for the day and only saw one panel discussion. But yes, we’re Disney cruuuuuuuuuusing next month!!! Better believe there will be a full report on THAT! I also posted on FB, because alot of my FB friends/coworkers love disney ! I am going to second the request for the Silhouette Shop. I am going to WDW in January and I am not sure if they also have the paper cutters. I’ll put it at the top of my list! The women who work there are truly amazing 🙂 and you get two of them! I love love love your site! Seriously, been reading it for a while, which is kinda creepy as you have no idea who I am. Hi. Going to Disneyland in October (YAY) and surprising the kids… Can you share any surprises you have seen or done yourself at Disneyland?? Alternatively, in a couple of weeks you will be able to enjoy the FUN that is Halloween at Disneyland… Can you share the BEST treats?? Coolest places to find pumpkins?? We were thinking about Mickey’s Halloween Party too this year. Let me know when you plan to go! Oooo caramel apples… *drool* — good to know they will cut them for you — faster to get them down my pie-hole!! Thanks for the pumpkin carving tip! We’re excited as we have never been at this time of year and likely will not go again during the Halloween time 🙂 A little extra fun for the kids!! That’s a good one, Stacey!! I think you should definitely write an entry about the Disney cruise. Oh, you can COUNT on it! I’m so excited about it! I think you should write about the turkey leg carts!!! I will, but I don’t like turkey very much, so it may be a short entry ;). Also you should write about the parking lots!!! Definitely–I actually am arranging a park-off with a friend, where we will start in the same place and one of us will go to the Toy Story lot and the other to Mickey and Friends and see who makes it into the park first. Take a little coordination though :lol:. I’d be interested in reading about the silhouette place. And, for the person who asked, there is one in WDW… its in France. Also, I’m interested in the petting zoo and the little cabin area above it. That’s an area of the park that we spend a lot of time in but I don’t think many people even know exists. I never responded to your message? What a jerk! Send me an email at MyYearWithTheMouse@gmail.com. Looks like there’s a lot of interest in the silhouette place. Cool! And the Big Thunder Ranch area is definitely on my list. I love Disney swag! We used to go to Disneyland every year when I was growning up, but I have not been back in like 10 years. My favorite rides were always Pirates of the Caribbean and the Haunted Mansion. I remember both being just a little scary when I was a little girl. Can you post about either of those? Love the blog too! I’m a frequent reader and I’ve told some friends about it! Haunted Mansion and Pirates are classics–definitely look for posts about those! I posted about you blog on my facebook. I also think you should post about the Haunted Mansion. Growing up my dad would tell us about how a ghost would sit with you at the end of the ride. I think that was his favorite part. He has now passed away but I think I will share this little thing with my daughter as a memory of him. My favorite part of Haunted Mansion are the hitchiking ghosts at the end too. What a great memory to share with your daughter, and I’m sure both you and she will think of him when you ride it :). Oooo, a Wait Wait fan!! Yay! Being on that show was SO much fun! And funny story, one of the producers (the one who arranges the guests like me) is a children’s writer. If you remember my entry where I met Judy Blume, I also ran into her at the same conference. Pretty cool. I like you, Shelby…on Facebook, but I also think that I would like you IRL, because you are sarcastic and funny. Sarcasm is my second language, if not my first. 🙂 I second (or third) the request for Pirates and the Haunted Mansion. My daughter has that t-shirt. LOL We saw it and decided it was perfect for her. 🙂 If there had been one in my size, I would have gotten one, too. Hey I did these things before without even thinking there were prizes available. I just like your blog. A post about the holidays at Disneyland. I know the holidays aren’t here yet but SOON! Halloween will be up soon, and that’s a great one too. I like, like you on, like, facebook. Like. Fantasmic!! I LOVE that show. I literally haven’t seen it in years! I would really like you to write about the Matterhorn. I know it’s been closed, but it should open soon. I’m sad they are changing the cars. My lil one is going to have to wait longer to ride it now. Now I’m off to Facebook to post a link to your page and tell everyone how funny you are. Oh I can tell you all about Shelby and the Matterhorn! Please post more D23 pics for those of us not lucky enough to probably ever go! I can’t actually recommend a future blog as I have only been to Disneyland one time. However that being said…I am completely obsessed and WISH I could do Disneyland everyday for a year. I am using your blog as a learning tool and I will be better prepared for my next trip in 2013. Thanks for sharing. Oh goodness, I’m not going every day! In fact, I just missed 7 consecutive weeks for my pass blockouts (did you miss me?) :). 2013 is a great time to go. Cars Land will be well up and running, Jolly Holiday Bakery and the re-arrange on Main Street will be done, and if we’re lucky the new Princess Fantasy Faire will be completed by then. I know it’s far away but it’s a great time to visit! Have you blogged about the updated Sleeping Beauty exhibit in the castle? I discovered it a couple of years ago and it is pretty charming. Also, I’d love to read a blog post about the shops in New Orleans Square, that little street that runs back by Pirates and the Blue Bayou restaurant. I’m always too overwhelmed by everything in that alley to explore the shops properly, and it’s usually kind of crowded when I’m there. I haven’t blogged the castle walk-through! It’s not stroller-friendly and I keep forgetting when I’m on my own, so thanks for the reminder. And New Orleans Square is definitely on the list. It does get so jam packed there though. The Disney books published by Golden Books are part of our licensing partnership with Disney—and they run the gamut from Little Golden Books to coloring books to Disney Fairies chapter books (and many formats in between).